October 27th, 11.30AM - Viewconference 2016, Turin (Italy). 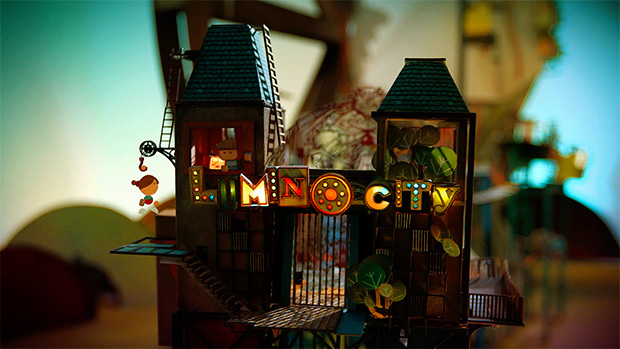 Luminocity is an adventure game for mobile systems, initially designed for iPad and released in 2012 (you can get more information here: www.stateofplaygames.com): its main peculiarity is how the game world has been created, made 99% in reality (not using computer graphics). However, not everything has been created in real; some moving parts have been added in digital: for example, the main character is made in this way: the boss of the company, in fact, is a former Flash designer and for this reason they used this software to create the main character and all the setup for all animations. This real world has been fitted into a videogame as multiple and small video sequences, used as background: some other elements (characters, items to used for interactions, etc) has been added in compositing or animated via code. To transfer in digital all the real game world, State of Play Games used a professional video camera system including a dolly system with costs extremely high: for this reason they rent this system for a single day; in preparation for shooting in that day's, they had to prepare everything with the utmost care and organize everything in detail, setting the world Luminocity inside the bathroom in the house of one of them, correctly placing all the lights and transcribing all sequences and the camera movements, and to have the opportunity to finish all video recordings in a single day. As all backgrounds are made as video, one of the main problems during the game analysis and development was how to optmize the size of the entire game once installed. However, after realizing, through a meticulous work of optimization, Daniel Fountain tell us that everything worked very well, and the video had an acceptable size. All that he have been told us isn’t a message to urge us to realize ourselves something similar: because this production costed too much and today technologies let us to develop games and other artistic works in much more cheaper ways, and more quickly than those who they used to accomplish their project; the message, however, is to not limit our artistic ideas to reach only those like to the market, to surf trends or the fashion of the moment, but always try to satisfiy our talent and and artistic intents. Then, an attendant ask Daniel on what he can recommended in order to achieve something similar to Luminocity; his answer is that having a team where there are people with some overlapping competences can be very useful: in their team each one had a very specific task, but also had a little competence or a vague understading in other roles covered from other people; this allowed everyone to work in a different way: thinking not only to find the best solution to achieve its own job in in less time, but also to think about what possible problems their solutions would have created less problems to their colleagues. This can mean that everything really worked as a team and in this way they could find - togheter - the best solution to complete the project in a less time as a team.